Celestial Influences is an essential astrological reference. It’s the calendar to hang on your wall, opening to 12” x 18”. 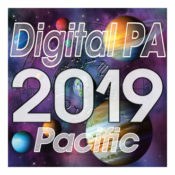 Available in Eastern Time or Pacific Time. 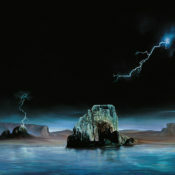 from Jim Maynard’s Celestial Calendars. 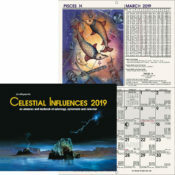 Celestial Guide 2019 is an astrological week-at-a-glance engagement caledar. It has plenty of room next to the daily astrological data for your daily notes, reminders, and appointments. 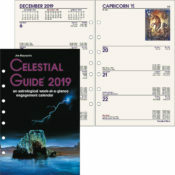 The Celestial Guide is also available as punched, loose, individual pages, ready for your day planner or 3-ring notebook designed for 5½" x 8½" paper. It has the exact same pages and information as the bound edition. Pocket Astrologer is a small, easy-to-carry, pocket or purse-sized version of the Celestial Influences. 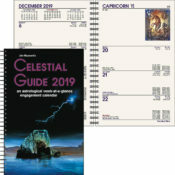 It includes an introduction to astrology, the 2019 calendar, an ephemeris, an asteroid ephemeris, a table of sunrises and sunsets, a blank chart form. Astrologer's Datebook is another astrological, week-at-a-glance, engagement calendar. It has exactly the same information and design as the Celestial Guide—just in a smaller size. 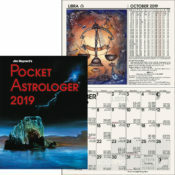 .Eastern Pocket Astrologer 2019 is back in stock as well as Celestial Guide 2019 wire bound. 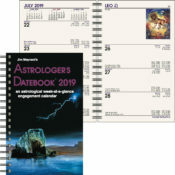 The Astrologer’s Datebook 2019 is back in-stock (February 8th). 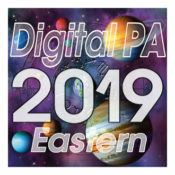 Digital Pocket Astrologer is now available here on our web site. 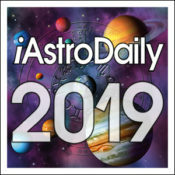 ☑ iAstroDaily 2019 is available now at the iOS App Store.